In a firefight when foam darts are flying everywhere, your hardware is as important as your skills with a blaster. 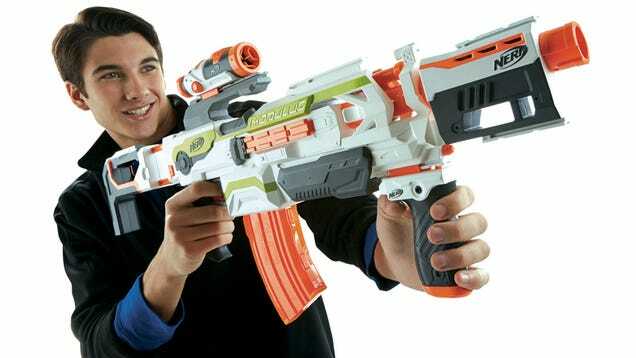 And because everyone's needs and preferences are different in the heat of battle, Nerf is introducing the N-Strike Modulus ECS-10 Blaster that can modified or reconfigured in at least 30 different ways. The Modulus base unit works perfectly fine on its own, but Nerf claims that the blaster's accuracy and performance can be further improved with the addition of clip-on accessories like better sights, shoulder butts, and larger clips for holding more ammo between reloads. The $50 base version includes a handful of accessories to modify the Modulus out of the box, but additional accessories will also be made available for purchase, so your blaster ends up being unique to you.